Walking along Cook's Stream, with small fields surrounded by ancient hedges, it seems you've stepped back in time several hundred years. Wander along footpaths lined with blackberries, dragonflies and butterflies dancing around your head. Jetting swallows whizz close by as you head for an amble along riverbanks. Read interesting memorials, the first to an unlucky victim of the Titanic disaster, the second a young girl who met a tragic end at the hands of her bigamous husband. Have a picnic lunch while viewing the largest meadow in England. 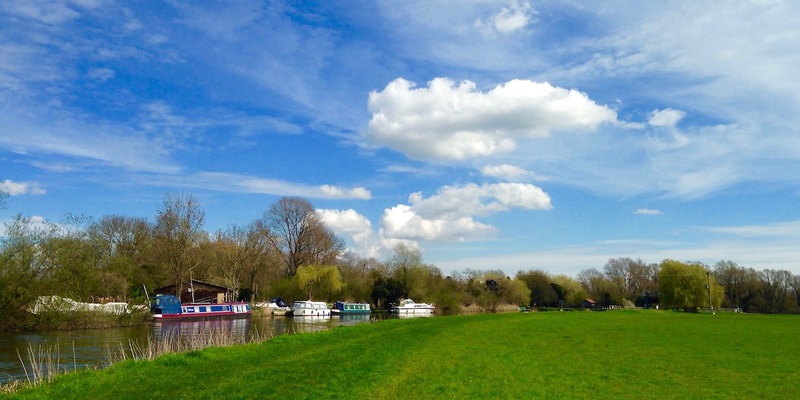 Visit two of the most charming villages in Cambridgeshire. With a break in the middle, this 7 mile (15,400 steps) route feels more like two comfortable walks put together. It's easy walking of great variety through woodland, fields, pleasant villages and along riverside. Quiet places to sit and rest. Great food or snacks available at several locations. Plenty of wildlife, wild flower and historical interest. If the River Great Ouse is in flood the walk is impassible between points 6 and 7. There is traffic noise between points 1 and 2, and around point 4. 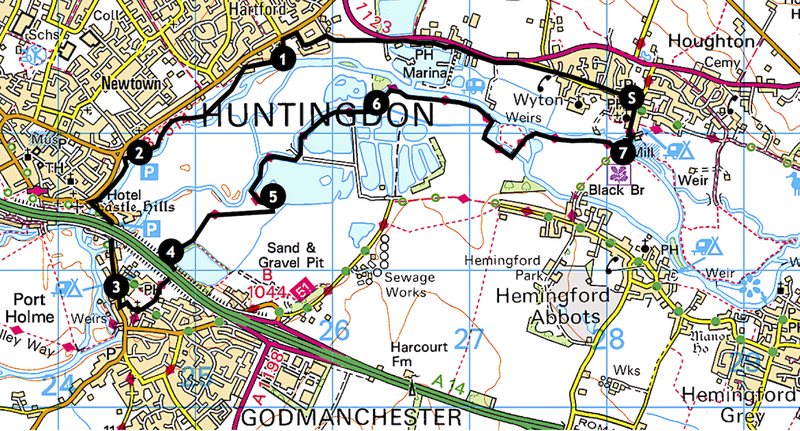 The route is shown below on the Ordnance Survey map. You can also zoom in on a satellite view of the walk at Google Maps. Park in the centre of Houghton and walk through Wyton (they're actually joined) towards Huntingdon. As you exit Wyton you'll come to the busy A1123. Rather than walk along the roadside path, you'll find a route along the top of the bank on the left. This drops down to meet the path. When you reach the entrance to Hartford Marina, walk in and turn immediately right to follow the footpath to the left of a hedge. This brings you back onto the A1123, which you cross to the path on the other side. After a few yards you cross back over to reach Old Houghton Road on the left, restricted to bus and foot traffic. The borders are very attractive in spring and summer, full of wild flowers and insect life. Walk a quarter of a mile and then turn into The Grove, a quiet private road on your left. When you reach Main Street in Hartford, the B1514, turn left and after 140 yards left again into The Hollow. At the bottom of The Hollow you'll reach the River Great Ouse. To the right is All Saints Church, dating from 1180 and with a delightful position beside the river. One of the memorials in the church is to R C Coleridge. In 1912 he agreed to accompany his friend, Rev A C Crosfield, the vicar of Hartford, to America for a holiday. Unfortunately he had to book on a different vessel to cross the Atlantic since there were no spare berths. He counted himself lucky to obtain a berth for the maiden voyage of a famous ship, the Titanic. He lost his life when the ship sank, an account being given in the Cambridge Independent Press. Take the path through the church grounds and along Church Lane for just over 300 yards. Pass Anchor Cottage and veer left to enter a wooded area and cross a footbridge. 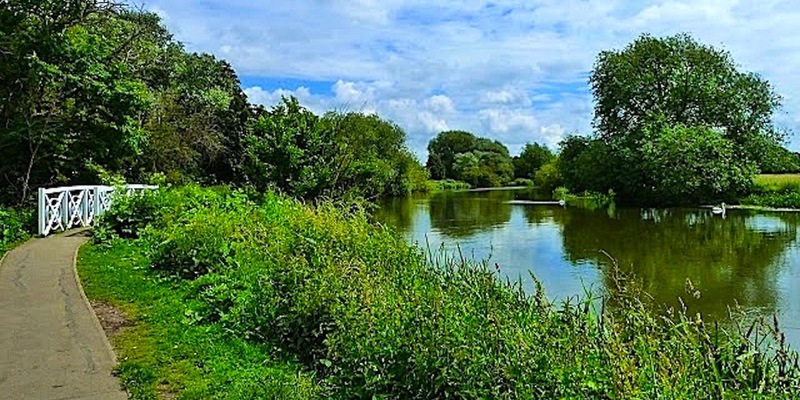 Beyond this is Riverside Walk, a pleasant route for two thirds of a mile as shown in the image below, skirting the River Great Ouse with reed and wild flower areas among the mown grass. Pity it's somewhat blighted by traffic noise, the curse of Huntingdon. When you reach a large car park on your right, follow the path as passes around a children's play area. A further quarter of a mile and you reach a parking area for offices. Walk up the slight incline. The aim is to walk over the Old Bridge, so you'll need to cross at the traffic lights and turn left to access the footbridge to the left of the bridge. Built in 1332, the sad view as you approach the Old Bridge sums up Huntingdon, an ancient town blighted by a ring road, inappropriate development and the constant buzz of A14 traffic. No wonder most photographs of the Old Bridge have the A14 flyover airbrushed out from the background. 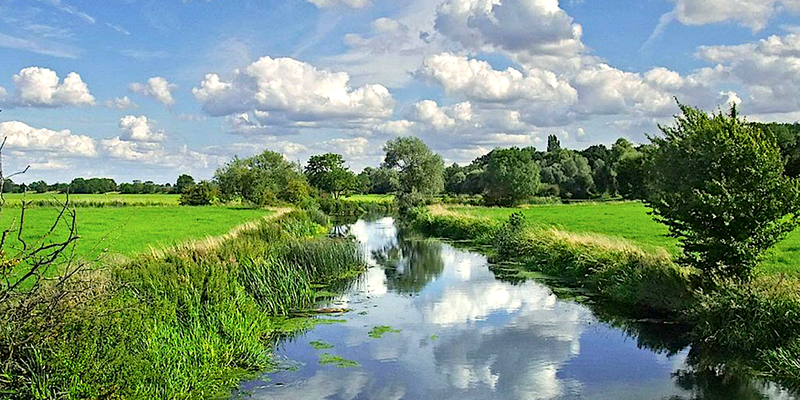 Cross the bridge and head along The Avenue for a third of a mile to Godmanchester, an ancient town and the site of a major Roman settlement. It's worth a wander around to admire the many listed buildings from the 1500s and 1600s. Fancy an outdoor picnic? Pop into Bellman's Bakery, just over 200 yards into Godmanchester on the left along Post Street. Great pastries and cakes, great prices. Then cross the road into Mill Yard carpark and over the Chinese Bridge as shown in the image below, to sit on one of the peaceful benches in Portholme Meadow, the largest meadow in England and certainly ancient. Or carry your food to picnic in perfect summer shade and solitude at point 5 below. To continue the walk, return to Bellman's Bakery and head off down Church Place, a little further along Post Street on the left. Enter the churchyard of the 13th century St Mary the Virgin and follow the path to the right, skirting around the church. Next to the path on the far side of the church is an interesting headstone. It tells the sad tale of Mary Ann Weems and her bigamous husband. Carry on along the path. After exiting the churchyard, continue straight on to head for what must be the noisiest cricket ground in England, blighted by the noise of A14 traffic. Walk around the boundary to the left and follow the path on the opposite side of the cricket ground, through trees and under the A14 flyover. Follow the route, called Cow Lane, filled in summer with blackberries, butterflies and dragonflies. The lane turns left and then right, passing a lake on your right. As you leave the lake behind there's a field edge to walk along. At the end of the field you reach the route of the old St Ives to Huntingdon railway line. Turn right and walk along the top of the bank for about 320 yards, then following the path off to the left which heads across another field. Cross through a stile into Godmanchester Nature Reserve, an area full of wildflowers, grasses and wild life. Island Lake to the right is full of bird life. Follow Cook's Stream on your left as it bends away from Island Lake. Continue to follow the path with the stream on your left, passing through a stile. This section of the walk is particularly pleasant as shown in the image below, an area of wild vegetation with small fields surrounded by ancient hedging giving the feeling you've stepped back in time several hundred years. You'll pass Roman Lake on your right, where a Roman well was discovered in the 1980s. Part way along this section you'll pass a long row of tall popular trees planted beside Cook's Stream. They were clearly planted there for a purpose since they're positioned in a pattern of a single tree, then two abreast. Whatever the reason, what they certainly provide on a hot summer's day is perfect shade to sit and rest, maybe have your picnic. The footpath leads into open fields. In summer and early autumn swallows jet just above grass level, catching insects. Sometimes they come close, appearing to be on a collision course. Follow the footpath through two fields until it meets the River Great Ouse. Walk along the riverbank, keeping the river on your left. On the opposite bank you see Hartford Marina, with floating homes, roofs doubling as verandahs. After a third of a mile the path takes a right angle away from the river to head for a footbridge. Over the bridge, cross a field and walk along the edge of a small lake and pleasant stream as shown in the image below. Go over a cattle bridge on the left and across another field to a footbridge over the weir at Four Gate Pit. Follow the riverbank for just under half a mile, cabin cruisers and long boats moored on the opposite bank as shown in the image at the top of this page. When you come to Houghton Lock, cross over the lock bridge and follow the path around to Houghton Mill. This National Trust property is worth a visit if open. There has been a mill on this site for over 1,000 years. The current building dates from the 1600s. Walk through the mill. Houghton Mill cafe is a few yards over to the right. You can buy lunch or a snack to eat on their well positioned picnic benches overlooking the mill pond, but they are a bit pricey and there is a better alternative in the village. A bit further beyond the cafe is a picnic spot beside the mill pond. This spot is very popular, with safe bathing so long as the mill wheel isn't operating. To continue the walk, after passing through the mill turn left and then right up Mill Street. Glebe Cottage on the left is a beautiful early 1600s timber framed and thatched cottage. St Mary's church dates from the 1300s. At the top of Mill Street you'll find yourself back to the village square and the beginning of the walk. 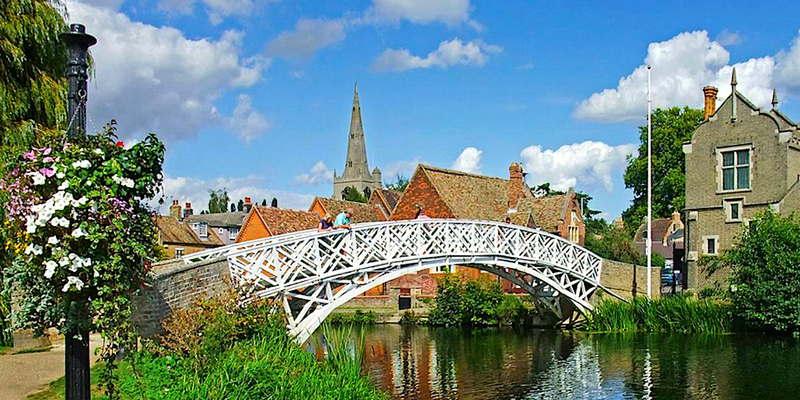 Houghton is a beautiful village of Anglo-Saxon origins worth walking around. There are many fine listed buildings. The magnificent, but less than perpendicular, timber framed cottage overlooking the square is the village's oldest house, dating from the 1400s. It was originally a yeoman farmer's house, subsequently the George and Dragon public house. On one corner of Mill Street is Houghton Tea Room, beside a memorial to Potto Brown, one of the best tea rooms for quality and value. If all the seats are taken, buy a take away meal and drink to sit under the clock tower in the centre of the square and watch village life pass by, or sit at the picnic spot beside the mill pond. A more formal alternative for a meal is the Three Jolly Butchers in Wyton, which you passed at the beginning of the walk. Dating from 1622, it claims to have the largest pub garden in England, stretching right down to the River Great Ouse with plenty of quiet spots to enjoy a pint. Click the 'Print Friendly' button below to print out this walk to take with you. Or for more walks click the 'Return Home' button at the foot of this page. Did you enjoy the walk? Notice anything unusual? Why not add a comment below to tell fellow amblers what you liked about it? 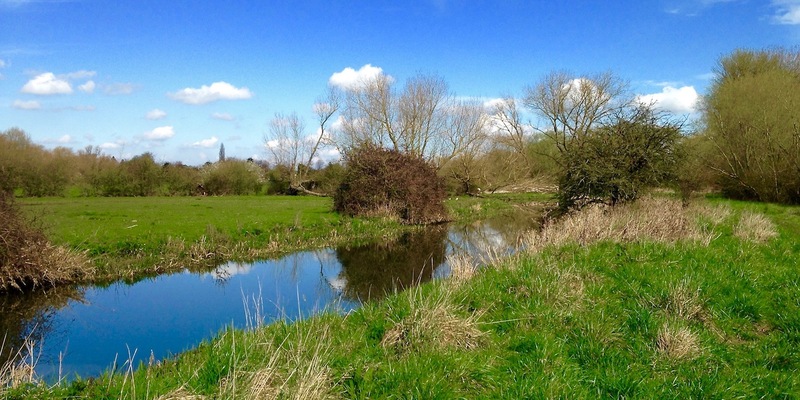 Point 5 is the Godmanchester Nature Reserve managed by the Wildlife Trust BCN. The trees are poplars near Roman Lake (where a roman well was discovered in the 1980's. Point 3 is Island Lake, again part of the Godmanchester Nature Reserve managed by the Wildlife Trust BCN. During the winter it is full of wintering wildfowl such as wigeon and teal. Many thanks for the information. I've updated the info above to include a link to your site under 3, and to name the trees in 5. What a surprisingly pretty walk! I had never taken the time to visit Hartford Church before - what a lovely gem in its river-side setting! And the Huntingdon Riverside Walk is pleasant as well. Just a correction, the private road off Old Houghton Road is The Grove, not The Grange. And I think the route through Godmanchester churchyard should be the left path, rather than the right (keeping the Church on your right). It will be interesting to see if the promised demolition of the A14 fly-over restores tranquility to the sections of the walk affected by traffic, both noise and the visual intrusion. At least we should regain a view of the Old Bridge that will not need any air-brushing to remove the monstrosity behind! The next thing to receive attention should be the Godmanchester river bank as seen from the footbridge over the river, which is looking very unloved at the moment.